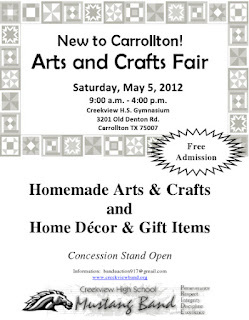 "NEW Arts & Crafts Fair in Carrollton! 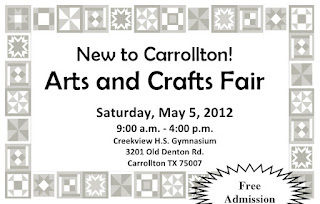 Saturday, May 5th Open to the Public from 9:00am - 4:00pm at Creekview H.S. 3201 Old Denton Rd., Carrollton TX 75007 to support the award-winning Mustang Band." Booths are (1) 6ft rectangular table and (2) chairs for $50. Each additional table is $25. There will be a concession stand inside the school in close proximity to the gym and it will be open all day for the purchase of soft drinks, bottled water, hot dogs, nachos, candy and snacks. For more information, visit their website or contact their event coordinator, Meryl, at bandauction917@gmail.com / cell/text 214.502.9516. "The John Paul II High School Cardinal Women's Auxiliary invites you to join us for our first annual Mayfest Market on May 5, 2012. Be sure to stop by our ""Tea Room"" for lunch and home baked goodies, as well as our Vintage Shop, located in the small gym." Booths are 10x10 and cost $150. This fee includes (2) tables and (2) chairs per booth (you can also bring your own), Free Continental Breakfast, Coffee & Tea All Day, Discount Coupon towards lunch, and Two Free Drink Tickets. For more information, their Market Agreement and Information are both online. You can also contact their event coordinator at kmuhlenpoh@aol.com. "Simply Chic" is a boutique style market in Frisco, Tx. Our market will be May 19th & features talented and unique small businesses and artisans. We hand select our artisans by the unique items they make. These boutiques are open to the public and feature a broad range of products – from home décor, accessories, clothing, gourmet sweets & treats, personalized gifts, handmade crafts, to children’s items – each show is unique and has a little something for everyone. What makes our market unlike any other is the atmosphere, products and experience. Swag bags for the 1st 20 shoppers and we will have lots of giveaways & drawings! We will also have a "Girl's night out crafting event & preview party on May 18th. See our website for all of the details!" Booths are 6x6 (larger spaces available by request) and cost $20. For more information, visit their website or contact their event coordinator simplychicmarket@yahoo.com. Looking for your own Event Listing? You can submit show information online. "Check out our Craft Fair!" 8 x 5 main hall - $30, bring your own set up. 8 x 5 class room - $40, comes with table & 2 chairs. Outside Vendor - $30, bring your own set up & tent. Applications are available in DOCX and PDF and are due by July 2nd, 2012. For more information, visit their website or contact their event coordinator at shannonmurphy0148@att.net / 972-977-9809. THIS FAIR HAS BEEN CANCELED. "We are doing a fair type fundraiser for our Class Reunion. There will be games and fun for the kids along with vendors selling their items. We will also be having a kickball game for the grownups to play. We all have reunions and know how much they cost so this is a way we figured we could help keep the alumni cost down along with having some fun. Jack FM will also be there to help out! " Booths are 10 X 10 and cost $25. Double booths are available for $40. This fee will include electricity, if requested. Applications are available here and are due by May 14th, 2012. For more information, contact their event coordinator, Kathleen, at rltclass2002@hotmail.com / mrsbrand11@hotmail.com. "CityArts Festival is an outdoor, free event. ARTFEST will be back again this year with thier visual artists form across the country. There will also be the Marketplace for vendors to sell their art, crafts, and merchandise.The Culinary Showcase will host local chef cooking demonstations and samplings, along with wine pairings, wine tastings and mixing sessions. There will be two outdoor film screenings after dark hosted by the Dallas Film Society complete with a dance contest on Friday night. There will also be musical entertainment, dance, and other performing arts featured on multiple stages throughout the weekend." Booths are 12 X 12 and cost $375.00. For more information, visit their website or contact their event coordinator, Wendi, at wmurray@thereedsprc.com / 214-871-0783. "25 MILES of Country Shopping at its BEST.Antiques, arts, crafts, quilts, western items and festival food." "Over 100 talented artists, crafters & designers will be selling hand-crafted items in a variety of categories. Raffle features items donated by each participating artisan and all proceeds benefit the Humane Society of Northeast Texas. The Humane Society of Northeast Texas will be on-hand facilitating pet adoptions throughout the event." "The 8th Annual Princeton Spring Onion Festival activities include Craft and Activity Booths, Food Vendors, Onion Cook-Off, 5K Run, Tennis Tound Robin Tournamant, 3 on 3 Basketball Tournament and Auction. All proceeds benefit the Princeton Lions Club." "The Wallace Elementary PTA is hosting it’s WE Shop Spring Market! This is a market you won't want to miss in Lake Highlands! Shop some great businesses from clothing and handbags to baby items and candy. You are certain to find that one-of-a-kind gift, or something special for yourself!"" "EDD is an annual, outdoor festival seeking to elevate environmental awareness and influence the way North Texans think, live and work. The family-friendly and free-admission event allows leaders in the corporate, academic and non-profit worlds to unite and show North Texans how green lifestyle choices can lower their cost of living, improve their health, and help save the environment." "Four times a year, we round up 70+ Texas creatives and companies under one roof to unload new and vintage goodies and grub. We also have live music, gift giveaways, and a free smartwater." Admission is $5. 12 and under get in free. "The Aspasians Art Fair has been a Rockwall tradition for over 30 years. Twice a year, on a Saturday in April or May and at the end of September, about 200 vendors gather around the downtown Rockwall square offering an extensive and diverse array of merchandise and delectable foods." "Events include a BBQ cook-off, museum tours, arts & crafts exhibition, carnival, live music, a quilt show, an auto show, a rodeo, the Fountain 5K Run, and other special attractions." "Ny6design Beads is hosting "Mother's day Gift Fair"! Come and WIN a "swarovski silver necklace" door prize, you can find the perfect gifts at incredible prices in following: one of kind Jewelry, Arts & Crafts, Fashion & Beauty, Gift Baskets and much more..."
Booths are 10 X 10 and cost $20 for NY6 customers and $40 for non-customers. Please bring your own table, you can rent tents and electricity from the show company at the phone number above. Applications are available here and are due by April 28th, 2012. For more information, visit their website http://Ny6design.com or contact their event coordinator at gmttidy@gmail.com / 214-507-8198. This week's giveaway is sponsored by Saratta of Diamond Diva, your one stop shop for hair accessories, headbands and bib necklaces for girls. Inspired by the accessories her mother made for her and her sister as a child, Saratta carefully designs each couture accessory to bring out the inner diva in every little lady. How to enter: Simply leave a comment on the site (due to the new Facebook Page Guidelines, we can no longer accept entries on Facebook) and tell us about the little diva you'd like to win this for! For a BONUS entry, share this giveaway on Facebook or Twitter (don't forget to tag us, @dfwcraftshows) and comment again below letting us know that you have done so. Please don't forget to leave an email address, if I cannot contact you then you cannot collect your prize! Contest ends at 10:00PM on Tuesday, April 24th, 2012. Winners will be announced Wednesday, April 25th, 2012. Entries open to the US only. Congrats, Elisabetta, you have WON this Black and Hot Pink Diamond Diva Baby Bib Necklace, a $25.95 value. This baby bib necklace is perfect for photo shoots, weddings, birthday celebrations and a variety of other special occasions and features a felt backing for comfort and ease of wear. Bib will be made to size of the child it is purchased for. Sizes available are: Small 6mos-2yrs, Medium 3yrs-5yrs, Large 6yrs-10yrs. Check out Diamond Diva for many more irresistible accessories for the little diva in your life and stay tuned to their Facebook Page for new product alerts! "Join us at the Winston School for a delightful day of unique shopping, crafts, gifts, food and entertainment! Conveniently located on the northwest corner of the Dallas North Tollway and Royal Lane, browse an array of shopportunities from artists, crafters and designers and enjoy lunch in the Happy Holidays Cafe." Each booth rental includes one chair. Vendors are welcome to bring their own tables and chairs or rent them at $10 per 8' table and $5 per extra chair. Electrical outlets are available for $10. Applications are available here and are due by June 1st, 2012. "Bray Elementary of Cedar Hill hosts an annual carnival, the largest single event of the Bray school year. Proceeds support school functions, including the school’s art program, which is solely supported by the PTA. This year, we are expecting more than 500 children and adults from throughout Southwest Dallas County. Although the carnival is a longtime Bray tradition—with games, live and silent auctions, bounce houses, dunk tank, raffle– this year we are opening up the carnival for vendors of arts, crafts and other wares. The event is publicized through local media, the school web site, signs, fliers and word of mouth from students and parents." Tables (6 ft) are available for $5. Electricity is available for indoor booths only and cost an additional $5. Applications are available here and are due by May 1st, 2012. If selected, you will receive a confirmation via email, booth assignment, and additional details. Those not selected will have their registration fees returned. For more information, visit their website or contact their event coordinator, Cynthia De La Cruz, at 469-223-4456 / cyndelacruz@ymail.com. You may also email braypta@gmail.com. "The MacArthur Orchestra Boosters are sponsoring a craft show for the MacArthur High School Orchestra. We will be featuring handcrafted items, as well as retail. All are welcome to come and shop! Thank you!" Fee includes 2 chairs. Electricity is available for an additional $10. Tables are available for an additional $5. For more information, visit their website or contact their event coordinator neesee01@yahoo.com / 682-503-6003 (please leave message and your call will be returned). "The vendors have asked, the customers have asked, and the merchants of Bishop Arts District have asked, so we listened and The Urban Bazaar ON Bishop in the Bishop Arts District is back!" "Dos Gringos Locos Market, held at Dos Gringos Restaurant the 2nd Saturday of each month starting March 10. This is an indoor market for unique, local arts/crafts, handmade, homemade, & small business owners in our community. Tables& chairs are provided& booths are $10,$15,$20. Contact: Danette Wicker@ 682-597-5653, www.danettesurbanoasis.com This is a monthly market, in a great location in the Cultural District in Fort Worth, Texas"
"Join us for Mesquite ISD Community Education's 2nd Annual Spring Fling Sell-a-Thon! Shop or Sell! Don't Miss Out!" "Don't miss this chance to shop local crafters and businesses! All proceeds will go toward The Bridge Connection." "This craft show is a fundraiser for Turning Pointe Dance Studio's company team to help support them in their quest to perform at Disney World this summer." "An abundance of fun-filled activities will pack the entire weekend, the ceremonial Blessing of the Vines and New Release Wines, and the captivating Wine & Gallery Trail, which incorporates an assortment of unique art galleries in Historic Downtown Grapevine and wine-related activities." "The Festivals boasts more than 250 juried exhibitors (home décor, gardening, artists, craftsmen, jewelry, clothing, etc. ), delicious country-style food, live entertainment and music, and tours of the historic community. A special Children’s Activity Corner provides pony rides, a petting zoo, face painting, barrel train and more." The parking lot is located on FM 1155 a short distance North of the intersection of Hwy. 290 and FM 1155. There is a $5.00 parking fee. "Local and regional artists will come out to play in downtown McKinney on Saturday, April 14, 2012. McKinney Main Street invites you to experience art in all forms as creative forte’s blossom throughout the Historic District. This all day event is a perfect opportunity to experience the magic of McKinney historic shopping district during the spring season with art, music, food and much, much more." "One Stop Shopping for All! Start your holiday shopping early. Seasonal items, floral design, gourmet specialties, jewelry, toys, candles, home accessories, ladies and children’s apparel, personalized items, handbags, shoes and so much more!" Applications are available here and are due by July 7th, 2012. "Join Bob Phillips and crew at his annual bash at the courthouse square in Waxahachie, TX featuring arists, craftsmen and chefs from Texas Country Reporter, games for the kids, autographs and everything Texas Country." Booths are 10 X 10 and cost $160. This fee includes 1 table and 2 chairs. Booths are 8 X 8 and cost $10 per market day. Vendor must bring own tables, chairs and a market umbrella. Canopies are not allowed. For more information, visit their website or contact their event coordinator at walise@grapevinetexasusa.com / srjohnson@grapevinetexasusa.com / 817-410-3185. "Summer Blast Exp, Craft Fair and Carnival Presented by the Grand Prairie Chamber of Commerce. LOTS of Vendors, Midway Rides and Games for all ages, Entertainment on stage area, Gourmet Food Trucks and Beverages! An evening of fun for the whole family!" Parking is $3 / car. Electricity is available for an additional $25. All Booths come with a 8' table and 2 parking passes. Applications are available here and are due by May 21st, 2012. For more information, visit their website or contact their event coordinator, Sara, at sara@grandprairiechamber.org / 972-264-1558. "A wonderful two day event is planned in the beautiful Hurst Conference Center with approximately 26,000 sq. ft. of exhibit space! This beautiful upscale facility is located just off Hwy 183/121 using the Precinct Line Road exit. Our event will not only feature artists, crafters and vendors, but also activities for kids and a Breakfast with the Bunny!! The event is FREE to attend and there's FREE PARKING as well! There is a fee for Breakfast with the Bunny. This centrally located venue attracts attendees from Fort Worth, Hurst, Euless, Bedford, Keller, Colleyville and Southlake." located just off Hwy 183/121 using the Precinct Line Road exit. "This shopping market is sponsored by Azle Christian Church Relay for LIfe teams. The vendor/booth fees of $25 benefit the Relay teams directly. Shop just in time for Easter and Mother's Day. The market will be open from 10am-2pm, April 7. 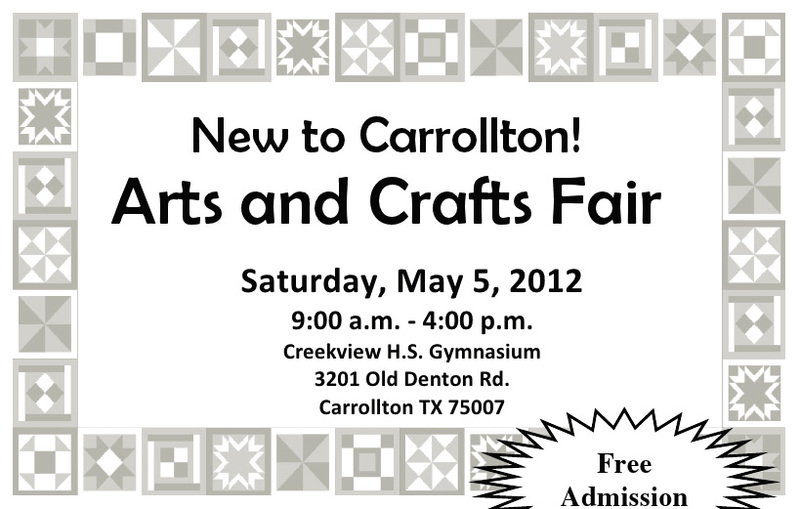 Please contact Ludonna Tipton, tifner@aol.com or 817-832-0754 for a vendor form and booth information. Handmade and direct sales welcome. This is a small show with approx. 24 booths. " "Arts & Crafts Fair, Carnival Games, Children's Events, BBQ - Bake Sale, Silent Auction, Bounce Houses, Pony Rides!" Electricity is an additional $10. Fees include breakfast. Applications are available here and are due by 4/15/2012. For more information, contact their event coordinator, Lola, at tcpcspringfling@yahoo.com / 817-233-5754 or LHardisty@sbcglobal.net. You can also reach Terry at tcpcspringfling@yahoo.com. Chairs are available and 10 ft. wide & 8 ft. high backdrops are provided. Applications are available here and will be accepted until the show is full. Applications received after September 20, 2012 will be subject to a $25 fee. For more information, visit their website or contact their event coordinator vendorinfo@shoppingseasons.com. "We have a day full of events for the whole family!!! Our indoor craft fair will have a wide variety of vendors from Scentsy and Pampered Chef, to local handmade crafts. Step outside to enjoy our Spring Car Show, Bounce Houses, Live Music, Food, and Face Painters. Stop by and support the South Garland High School, Class of 2014!!!" Booths are a 6 X 3 table space for $60. You may purchase additional spaces for $45 / ea. These fees include your table and a voucher for lunch (hot dog and drink). Vendors are asked to donate one item for door prizes. Applications are available here and are due by April 15th, 2012. For more information, contact their event coordinator SEDailey@Garlandisd.net / Lisa Davis - LDDavis@Garlandisd.net. This week's giveaway is sponsored by Wood Worx by John. John and his wife work together to create original designs and exceptionally crafted wood art. From custom mailboxes to post covers, holiday decor, and everything in between, Wood Worx by John provides you with a one stop shop for personally designed, hand cut, and painted, wood art with meticulous detail. How to enter: Simply leave a comment on the site (due to the new Facebook Page Guidelines, we can no longer accept entries on Facebook) and tell us what you are growing (or hope to grow) in your garden this summer! For a BONUS entry, share this giveaway on Facebook or Twitter (don't forget to tag us, @dfwcraftshows) and comment again below letting us know that you have done so. Please don't forget to leave an email address, if I cannot contact you then you cannot collect your prize! Contest ends at 10:00PM on Tuesday, April 10, 2012. Winners will be announced Wednesday, April 11, 2012. Entries open to the US only. Congrats ten b, you have WON your choice of one hand cut & painted Texas Flag Cowboy Boots, Texas A&M Cowboy boots or UT Cowboy Boots by Wood Worx by John, a $22 value! With John's intricate designs, you can show your spirit in style! Check out John's site to see the many designs available or to start your own custom order! Booths are 6 X 6 and cost $50. Electricty is available, free of charge, to a limited number of vendors. Their vendor letter is here. Applications are available here and are due by April 15th, 2012. For more information, contact their event coordinator, Misty, at txtoethongs@yahoo.com / 817-233-0862.